Electric Scooter Battery Chargers. Got a bad charger? Pick one up from Wild! We have all voltages in stock and ready to ship today. Not just for scooters, these chargers can be used to charge any lead-acid battery pack. A few important considerations when purchasing a new charger. First is battery type, if you have a traditional lead-acid battery pack (Also called "SLA") you need to use a lead-acid charger. If you have a lithium battery then you need a lithium charger. Second consideration is the voltage, pretty straight forward...just find out what voltage your vehicle is and get the proper charger of the same voltage. Using the correct charger is EXTREMELY important, using the wrong charger could result in damage to your battery, or even a fire or battery explosion! Its pretty easy to determine what type of battery and the voltage you have. Check the specs for your unit, or just give us a call. 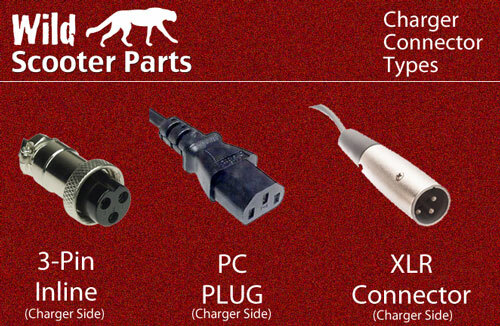 There are three commonly used connectors for chargers, be sure to choose a charger with the propper connector. Here is a picture of each type.